The most apparent visual changes are the inclusion of multiple animated Activity stickers inside the Messages app. The first appeared in beta 3 and we have even more this time around. They don't need to be unlocked either, and are available to everyone. Scrolling appears to be somewhat quicker, Control Center is now bouncier, Memoji has a few new options for lips and Workouts has new icons. As usual, a number of bug fixes from past betas have been built with, such as setting a wallpaper from an image, while Safari Private browsing mode has returned (it went missing for some in the last beta), and more. Unfortunately, new betas mean new bugs. Siri Shortcuts can have issues, especially when used with HomePod, and Wallet can still unexpectedly crash. Surely these issues will be handled before iOS 12 gets released this fall. 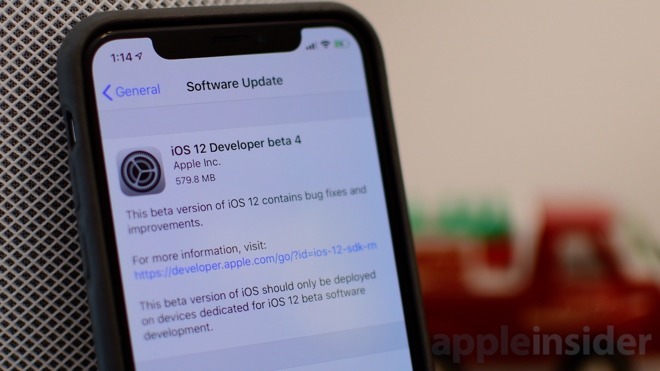 New "more info" icon in Wallet going from "I" to ""
iOS 12 beta 4 was released to developers alongside the latest betas of watchOS 5 and tvOS 12.